Expect nothing short of outstanding value with the ThinkPad Pro 90W Dock. Snap your system into the ThinkPad Pro Dock and enjoy all of the connectivity options you could ever need. 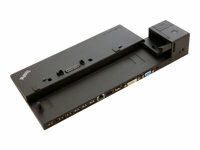 This Lenovo ThinkPad docking station comes with a ThinkPad AC Adapter which can power and charge your ThinkPad notebook. The Pro 90W Dock connects your ThinkPad to a power supply, the Internet, up to 2 external displays, a keyboard, mouse and a printer. One of the dock's 3 USB 2.0 ports allows you to charge your mobile phone or tablet, even when your notebook is elsewhere. The USB 2.0 ports are perfect for connecting all of your most frequently used workplace accessories, from mice to keyboards to printers. This ThinkPad docking station also offers 3 USB 3.0 ports for connecting memory keys and external hard drives. The dock is driver-free yet offers a superior level of video quality. It comes with 10/1000 Gigabit Ethernet connectivity, 1x DisplayPort 1.2 (for exclusive use with DVI-D), 1x DVI-D (for exclusive use with DisplayPort), 1x VGA port and 1x Stereo/Mic Combo Audio Port. The cable lock slot allows you to secure the dock to your desk or workspace while the eject button offers quick, effective, one-step notebook removal.